It’s back by popular demand! 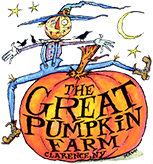 The Hands-free World Pumpkin Pie Eating Competition will take place at 1:00 p.m. this Sunday, October 15, as part of the Fall Festival at the Great Pumpkin Farm in Clarence. Professional eaters from Western New York and around the country will try for a new world record – and compete for cash prizes – in the seventh annual, officially sanctioned Competition, held in conjunction with All Pro Eating Promotions. Mollyl Schuyler, who also won last year’s competition by eating 48 pieces in 10 minutes and is currently ranked the #1 Female Independent Competitive Eater in the World (according to her Facebook page) or someone else beat her record this year? Find out this weekend! Prizes totaling $1,800 will be awarded, including the $1,000 grand prize. Pig Racing takes place on Saturday and Sunday, with five post times each day: 11:00 a.m.; 12:30 p.m.; 2:00 p.m.; 3:30 p.m. and 5:00 p.m. Guests of all ages will delight in this hilarious, fast-paced event! Zombies in t he Cornmaze! this will be our last weekend with the Zombies roaming in the cornmaze – you won’t want to miss it! Funny Faces Drawing Contest Kids ages three to 14 can compete for prizes in several categories on Saturday and Sunday from 11:00 a.m. to 4:00 p.m.
As with every year at the Fall Festival, there’s something for everyone, including the corn maze, hay maze, magic show, Boo Barn, amusement rides and more. Guests can also purchase pumpkins, gourds, mums and cornstalks and visit the bakery for freshly baked pies, cookies, pastries, candy and cider.